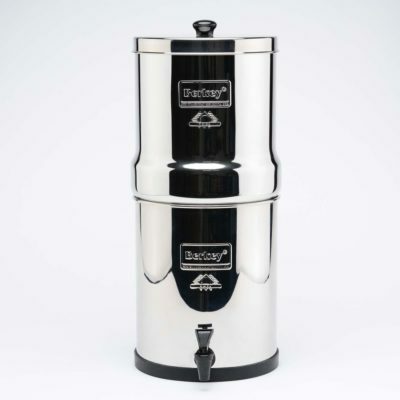 The versatile Royal Berkey® system is the ideal water filtration system for use at home with large families, travel, outdoor activities or during unexpected emergencies. Comes with 2 Black Berkey Elements. Free Shipping in the USA, but we cannot ship to California or Iowa. What does the Royal Berkey Remove? Height x Diameter (inches) 23” x 9.5”; The upper chamber nests within the lower chamber for transport and stands only 15.25” in height. Holding capacity: Aprox. 3.25 Gallons. Configured with two Black Berkey® purification elements the system can purify up to 4 Gallons per hour. Be the first to review “Royal Berkey System (Scratch & Dent)” Click here to cancel reply.